We sure tend to skip around to among our different topic keys here at Peak Stupidity, but ideas just crop up. This comes from shopping for gas in multiple states, at different tax levels, on a road trip. Sometimes it can be a real work of art, deciding exactly where to stop between piss/nab breaks and gas stops, especially with kids that can't last forever. When on my own on one of those long cross-countries, it was all about speed too - no gas stops until < 1/8 tank fuel, unless out in the desert, and the junk food ("nabs" in Southern parlance) and pee breaks had to occur during those fuel stops. Yeah, ya gotta watch your water intake! What was that about? OK, we're concentrating on the prices. I remember the parents shopping around for 2 cents cheaper gasoline. There are some bad brands, but for the most part, gasoline is gasoline, and you don't need that V-Power! for most vehicles. (Higher octane-rating, if you don't need it, is not helping your fuel mileage.) There's a limit to that madness - how much is your time worth? Even if not much, you'll get to where the cost of the gas burned in the search approaches the difference in amount saved at the lower-priced station. For a 12 G purchase, even with a 20 cent difference (reasonable nowadays), you may be talking 20 city miles before it was a waste of your time, and really close to 5-10 miles before it's not worth it, practically speaking. Americans have lived so well so long that many feel they are too good for this sort of low-class behavior like asking for the price of something not marked. Yet, "We can't be forever blessed ..." goes the line in the Paul Simon song linked to. It'd be wise to at least try to be frugal and not too proud to stoop that low. 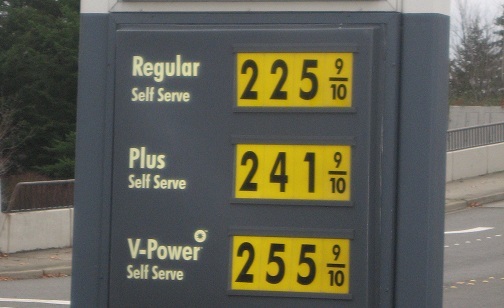 In thinking about the gas prices, a point made by zerohedge commenters back in "the day" came to mind also. 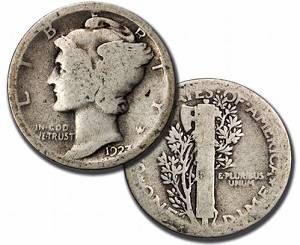 It's a thing that should NOT be amazing to anyone who understand what sound money is, but it still amazes me: Two silver dimes that could buy a gallon of gas back in the early 1960's, when the dimes WERE silver, can buy a gallon of gas today also. they are the farthest thing from junk money there is. * I used the irony quotes, as it's really that those 15 pieces of green paper are seen to be worth 2 silver dimes ... for now! ** In fact, if the prices were more like that 30 cents/gallon back in 1964, then, 2 silver dimes would have gotten you 0.83 gallons, and they could get you those same 0.83 gallons at $2.62. I can get it cheaper than that.